Find the perfect fit, whatever your body type, with The Idle Man’s guide to selecting the best shirts for your shape. Check out more from our Men’s Style Guide here. Tired of tent-like t-shirts? Irritated by ill-fitting oxfords? Never fear: picking a shirt that shows off your charms doesn’t have to be complicated – you just have to know where to start! From work to play, there are many ways to mix up your wardrobe and emphasise your unique qualities without breaking a sweat (or the bank). Here’s our guide to finding the best shirts for your body type. Before we get started on how important it is to pick the right shirt for your body type (believe it or not, there are distinctions when it comes to choosing dress shirts for small guys, tall guys, and so on), we'll go over how a shirt should fit against the body in general, covering length, the right placement of the seams and all the occasionally dull things that really do make a difference to your look. Chest: the best shirts allow a full range of motion, fitting comfortably around your chest, across your back, and under your armpits. If you have selected a shirt with a slim cut, it should be snug rather than tight. Shoulders: check where the sleeve of the shirt attaches to the body. This seam should sit comfortably near to the top of your shoulders; it should not ‘pull’ or billow. Collar: this should be comfortable but not roomy. See if you can button it easily and if you can slide two fingers inside: fewer than two and it will be too snug, more than two and it will be too big. Feel free to adjust: You don’t have to go fully bespoke to enjoy a tailored feel. With a few tweaks, a tailor can adjust an off-the-rack product to suit your shape. Pay particular attention to the waist and arms: nothing makes a short man feel more awkward than sleeves that hang down too low or a shirt that billows around the waist. 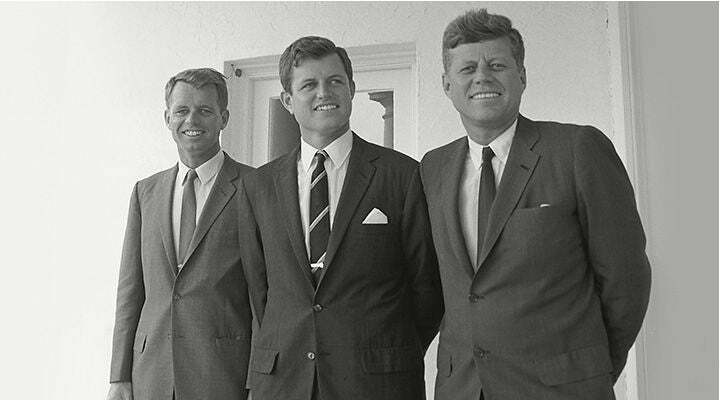 There are four main collar types: pointed, spread, button-down, removable. And though it may seem like a small detail, the collar that you choose can have a big effect on your overall look. A shorter man should prioritise a crisp, streamlined look wherever possible, and thus avoid a button-down in a formal context (unnecessary detail) or a spread collar, as this creates the impression of width rather than height. For a guy with a heavier build, we recommend a pointed collar as this can be slimming and flattering for a wider face. If you’re the tallest guy in the room, a spread collar might be a good bet as it will create a sense of balance. A button down oxford shirt is an important bit of kit with an impressive lineage. In fact, this sassy little number doesn’t come from Oxford at all: it originates from Scotland. Way back when (the 19th century, to be exact), Scottish fabric mills began to experiment with different shirt weaves and styles. This culminated in the invention of four different fabrics: Cambridge, Harvard, Yale, and Oxford. If you’ve never heard of the other three, don’t fret: the Oxford weave soon overtook them in popularity and production stopped on all but the Oxford some time ago. Rumour has it that the oxford shirt’s famous button down design came into being because the fabric was favoured by pre-1930s polo players, who found it impractical to have shirt collars flapping around during matches; either way, the shirt has proved popular with sportsmen and presidents alike. Finding the perfect shirt is difficult, especially if all you’re after is a crisp white oxford that has nothing on it to detract from the cold hard truth that it just doesn’t fit you very well. Some experts will point you in the direction of a Slim fit (but beware because even the slimmest of men will suffer from the buttons pulling apart at the front). Others will tell you to go for an American Box fit (too baggy and often making the more well-built man look like he’s going to take off with a parachute on this back). We’ve dressed boxers of all shapes and sizes, and we find that keeping the sizing simple is the best option. Check the collar fits, check the arm length, and check the shoulder seams are correctly positioned on the edge of your shoulder. Distinguished by its fairly rigid fabric and basket weave (which is formulated by two different yarns that are woven together), the white oxford has earned the accolade of ‘best white shirt’ thanks to its versatility: ideal for casual and formal occasions, and most weathers, it will serve its wearer well in a variety of settings. It's the perfect piece for pretty much every suit out there, and with it's various fits, there's going to be one out there to suit every size. For an easy formal look, try matching a white oxford shirt with a light grey suit, adding in a neutral coloured tie if you want to add some more dimension to the look. 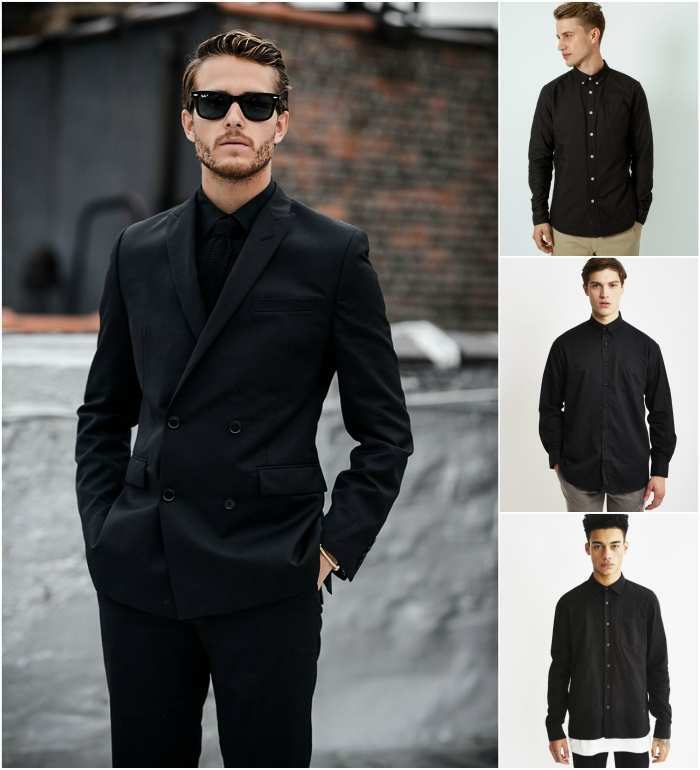 Black shirts aren't everyday choices in menswear, but there are ways to incorporate them into an outfit without them looking too striking. One sleek option is to pair a fitted black or navy suit with your black shirt, which will help give you a bold yet put together look that maintains a sophisticated vibe. 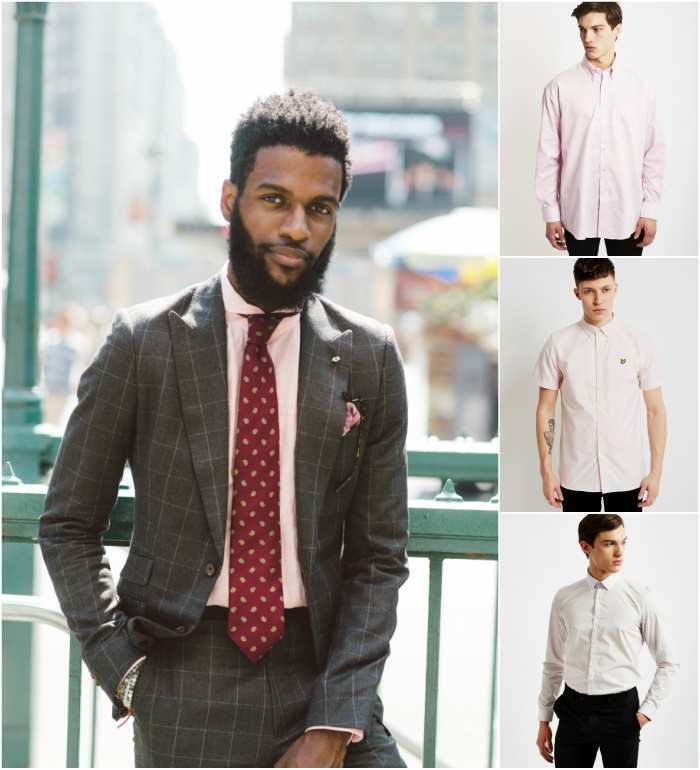 A pink oxford shirt is a great option if you want to achieve a clean, light look, but don't feel like sticking to a classic white colour. Pink goes great with navy suits, with the cool tones of both colours complimenting one another and creating a subtle contrast. It's also a great choice if you're dressing a grey suit, especially a light grey one, and gives a more summer friendly alternative to the classic black suit and white shirt. A blue oxford shirt is the perfect option when you're dressing up a navy suit or if you want to create a smart casual look with a pair of jeans. The versatile, cool tone colour means they're able to match with a number of looks, and you can easily create a stylish look with just a pair of chinos and a some brown leather brogues. 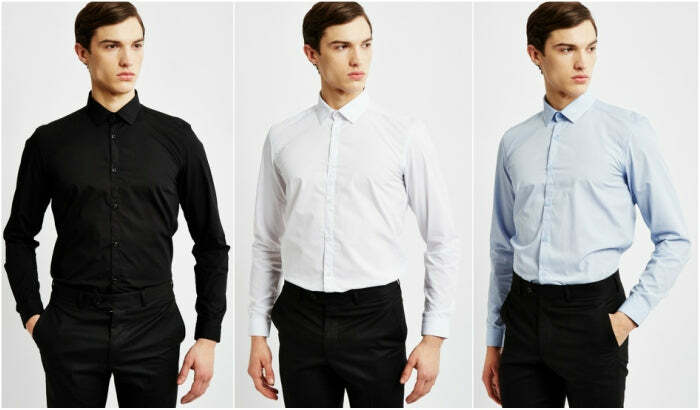 If you've got a small frame and you're looking for something to compliment your shape, then it might be a good idea to have some shirt options in your wardrobe other than the oxford shirt. A fitted dress shirt, or simple slim fit shirt could be a great addition, and would match with both smart and casual looks. 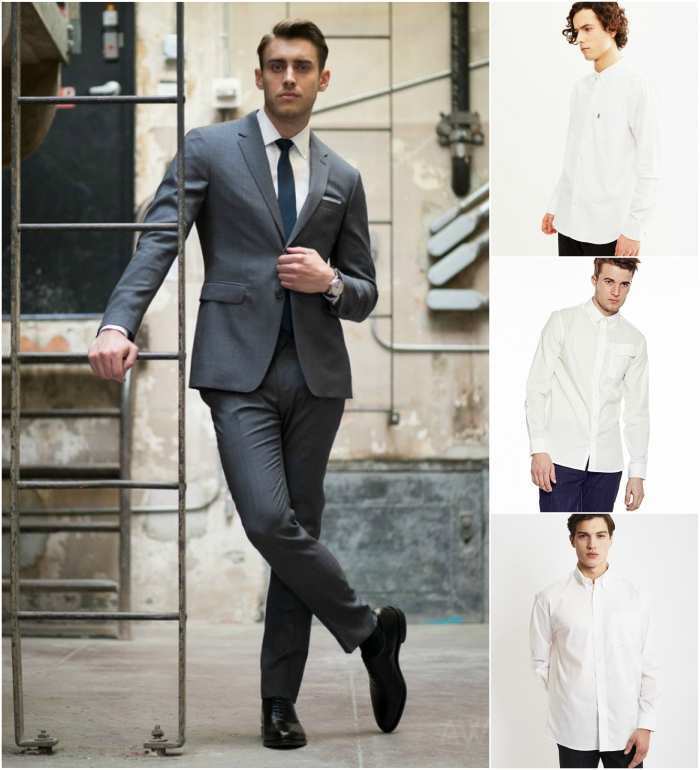 If you're wondering 'what are fitted dress shirts', then let us enlighten you. 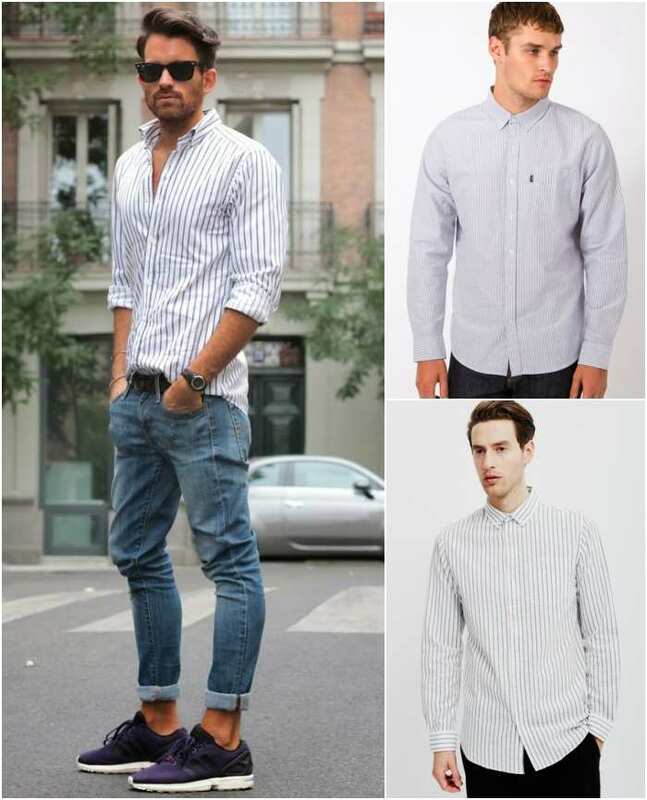 A fitted shirt, sometimes referred to as a european cut shirt, is essentially a shirt that tapers in at the waist a little more than the standard oxford shirt. It can also be referred to as a fitted shirt, and gives a more tailored, elegant shape, perfect for wearing both tucked and untucked. This is a shirt that can flatter a slim form, as it helps accentuate your slim waist while staying well fitted around your chest and shoulders. Anyone who has broad shoulders, or just a much narrower torso compared to the rest of their body is going to benefit from this tailored shirt. This shirt does come with a few negatives though, and although it's flattering on skinny forms, it's not the best choice for anyone whose holding a bit of extra weight. The tailored shape is going to cling to, and accentuate, any bulk, creating strain where there shouldn't be, and an irregular form in general. If you're on the slimmer side of the scale and most regular fit shirts leave you looking swamped and shapeless, have no fear, there are some other options out there for you. It's important that you always follow the basic guide on how a shirt should fit, however not all cuts are going to compliment your form, so in general it's better to go for a slim fitted shirt that tapers in at the waist. This shape will take your body into consideration, skimming down your narrow waist while staying close to your shoulders and torso as well. There's no need to hide in a shapeless sack if you're carrying a bit of extra weight. The main thing when dressing a bigger build is to always maintain the right fit. Baggy, ill fitting shirts are just going to make you look bigger, while shirts that are too tight are just as damaging. Stick to a regular fit, oxford shirt and ensure that it's long enough, reaching down to the curve of your buttocks, and slim enough, skimming across your chest and stomach. For some extra 'security' try a shirt in a thicker material, to make sure you feel supported but not constricted. If you're a little shorter than average then finding a shirt that looks right and doesn't accentuate your small form can be tricky. You want to give the illusion of length while adding a streamlined look to your outfit. Striped shirts can help give the illusion of length, as long as the stripes are going down, so choosing one in a well fitting design is a quick way of adding some extra height. It's also best to stick to a shirt that's long enough to tuck in. A tucked in shirt helps draw attention to your legs rather the cover and shorten the look of them. One last tip is to spend a little extra money and get a few custom made shirts. Finding the right tailor can drastically change the way you look in a suit, and really ensure that you're wearing a shirt that caters to your shape. We've covered a few 'rules' on what shirts you can wear depending on what kind of body shape you have, but there are some things that you should avoid in a shirt no matter what body type you are. 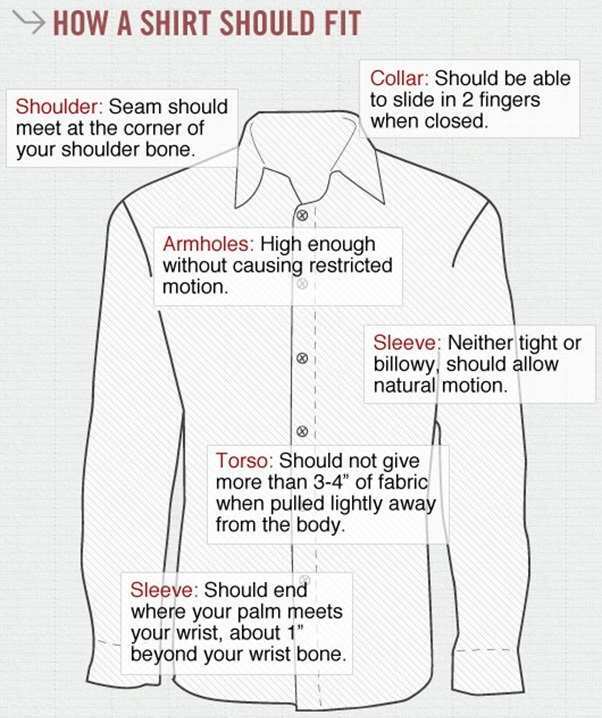 Ignoring these rules can lead you to looking and feeling uncomfortable in your dress shirts, even your best white button down shirt that everybody agreed looked great on the hanger. It's pretty important that you can move around easily in your shirt. You might not be ready to play basketball in it, but tight fitting shirts around the arms is a no go. Do not get the idea that a shirt that's tight around the arms is the answer to how to make your arms look bigger, as it'll actually just make skinny arms look skinnier, and make you look oddly proportioned. So, even if you're dealing with scrawny arms, make sure they have room to breathe and build muscle. Shirts need to be long enough to tuck into the waist band of your trousers and stay there even when you're raising your arms. A shirt that's only just brushing your hips is going to look too small for your body and give the impression that you're wearing a fitted dress shirts that you had when you were 12. The length of your shirt is just as important as the width, so always remember to keep it in mind. Ah, the humble t-shirt. Originally designed as part of the uniform for the U.S. Navy (we say ‘uniform’ but really the shirt was underwear that was meant to be worn underneath), the ‘T-shirt’ gained its name from its shape: a classic crew-neck and short-sleeve configuration that resembled the letter T. Easy to clean and relatively inexpensive, the t-shirt soon became the go-to item for mothers to choose for their children; and the term was officially recognised by the Merriam-Webster dictionary in the 1920s. Once a simple garment, the t-shirt has developed into quite the style staple – and the options are endless. Sleeveless, cap sleeve, short sleeve, three-quarter sleeve; plain, patterned, graphic, embellished; round neck, v neck, scoop neck; and don’t get us started on fit…. Fortunately, whether you want to know how to make your arms look bigger, what material to prioritise or whether to go for tight-fitting shirts around the arms (depending on your body type), following a few simple steps can ensure that your t-shirt is exactly to your taste. Give it the finger. This might sound rude but we’re not talking about flipping the bird; no, we’re talking about an ingeniously simple way to test your t-shirt size – or, more precisely, the sleeves. If you’re hoping to find a shirt that flatters your biceps, pay attention to proportion. It’s not all about choosing shirts that fit tight around the arms, but too much fabric can lead to the appearance of skinny arms, so slide your fingers inside the shirt sleeve: if you can fit more than two fingers inside, your shirt is too big. Size it up – and have confidence. Most men err on the side of caution and opt for a size bigger than necessary. When it comes to t-shirts, don’t. 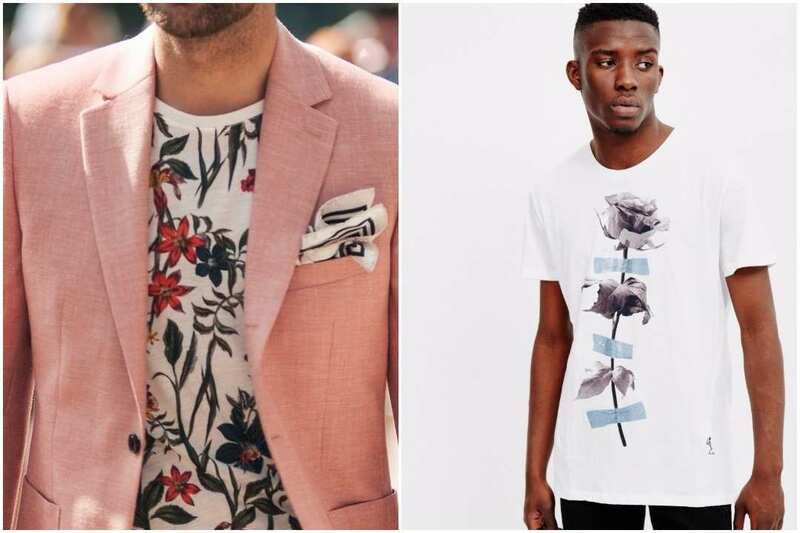 The style and fit of a t-shirt means that the best shirts are not the baggiest: slim men will seem swamped by the material and heavier gentlemen may appear larger than they are in reality. Have confidence: opt for a t-shirt in a smaller size (eliminating the appearance of scrawny arms) or, if that would feel uncomfortably clingy, go for a wider neckline and a dark colour for a balancing and slimming effect (or layer it up – see below). For we are living in a material world… For most, t-shirts mean one thing: cotton, cotton, cotton. But this may not be the most flattering material, particularly if you’re hoping to boost the appearance of your arms. Take a close look at the tag: a cotton t-shirt with a bit of stretch would be ideal for enhancing the impression of muscle definition. Play with colours and layers. If you’re larger in build, don’t shy away from a well-fitted t-shirt. Instead, layer it up. Team a black v-neck with a tailored jacket and instantly streamline your form. Alternatively, opt for some colour contrast: a raglan t-shirt with brightly coloured arms and a monochrome body (black or white) will accentuate your arms and shoulders in a flattering way. 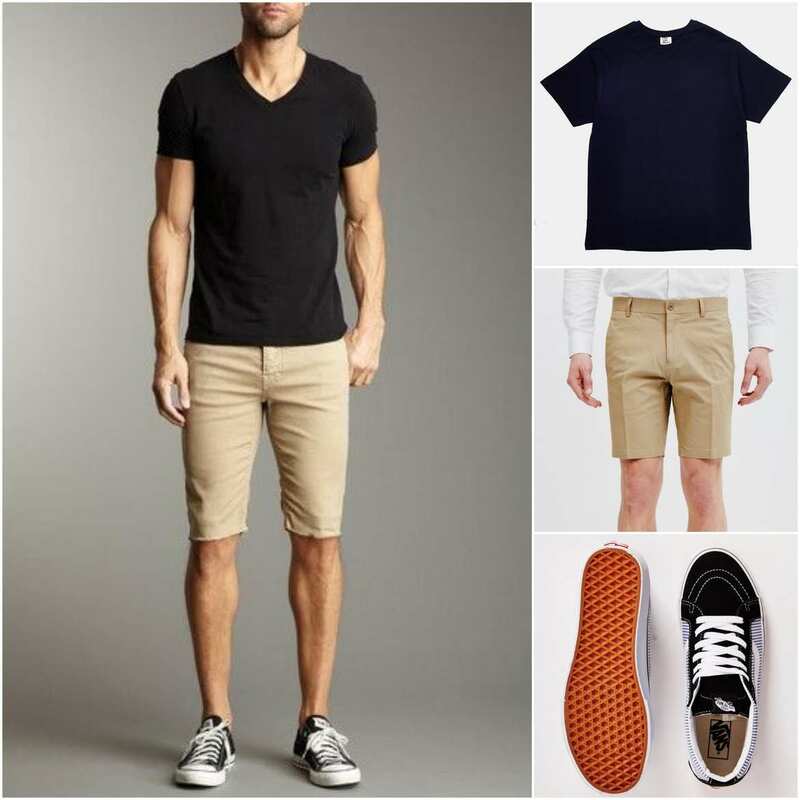 Whatever style you go for, t-shirts are crucial components of any modern man’s wardrobe: so shop well, and shop often. We recommend buying your staple colours in bulk – grey, white, black, navy – and then splurging on a few statement pieces from time to time. There are so many ways to wear t-shirts: grey t-shirts with blue jeans, and navy t-shirts with black jeans, are the epitome of casual cool, as are white t-shirts underneath a lightweight suit and Converse trainers; an ever-chic Breton striped shirt with a pair of chinos makes a perfect spring statement; or, for a quirky yet stylish summer look, team a graphic print (as pictured below) with a pastel-coloured blazer. In this picture, Tom Cruise teams a pale blue oxford shirt with dark jeans and aviators for a perfect spring look. But his outfit isn’t as casual as it seems: it’s been carefully designed to make the most of this diminutive star. Not only does Cruise don an oxford shirt that is beautifully cut (slim-fitting without being clingy), the shirt is adorned with narrow, vertical stripes – a great way to create a sense of height. Note the oh-so-informal sleeve-roll, showing off a bit of a forearm and ensuring that there are no awkwardly hanging cuffs (though we’re sure Mr Cruise has his shirts tailored within an inch of their lives, anyway!). The untucked shirt is daring – normally shorter men are advised to tuck shirt tails in to emphasis length of leg – but the piece is cut so well that he gets away with it. Adam Richman may be famous for eating challenges and BBQ competitions, but over the years he’s also gained a reputation as a style icon for the larger gentleman. Though he’s recently shed an impressive 70 pounds, his wardrobe still consists of some key fashion staples: quirky t-shirts, well-cut suits, and dark trousers. 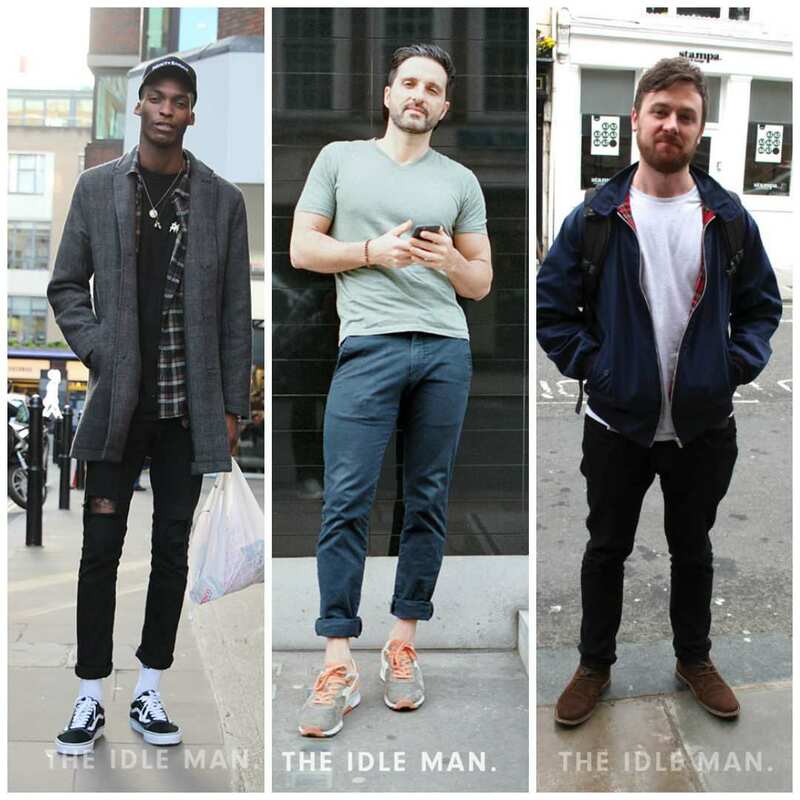 The king of layers, in these images Richman goes for a bright green shirt underneath a checked shirt (right) and an all-black ensemble (left). The black outfit is our favourite: a bold graphic print t-shirt with fitted blazer creates a slimming yet stylish effect. For an edgy finish, Richman tops the look off with black aviators and plenty of stubble. Forget Man Finds Food – this is Man Finds Fashion. Two very different looks from two pint-sized pop stars: and we love both of them. Usher’s bold use of colour could be seen as the antithesis of streamlining, drawing attention to detail rather than creating height, but somehow it just works. His cleverly-tailored tan Armani three-piece suit is set off beautifully by a black pocket square, black spotted tie and checked dress shirt; the pointed collar of the shirt narrows and streamlines whilst the day-to-night aviators draw attention upwards. A super-stylish, daring look. No less stylish but a little more simple, Bruno Mars also rocks a pair of sunglasses – and huge hair – to attract the gaze of his viewers upwards. He too favours a dress shirt with a pointed collar, this time in crisp white; but with a shorter waistcoat than Usher, which creates a sense of height by lengthening the leg. For an on-trend, brave finish, he wears his trousers slightly shortened, which all plays into his quirky sense of style. First make sure you're aware of how a regular shirt should fit, taking in the correct length and tightness around the waist and torso. If you're on the larger size, avoid the urge to go bigger with the fit of your shirt, as loose fitting shirts will just make you looking wider. Instead ensure that your shirt evenly skims across your waist and chest, and is long enough to cover any extra bulk. If you're skinner than average, go for fitted dress shirts over oxfords, as the tapered waist will compliment your narrow waist while keeping the rest of your body in proportion. 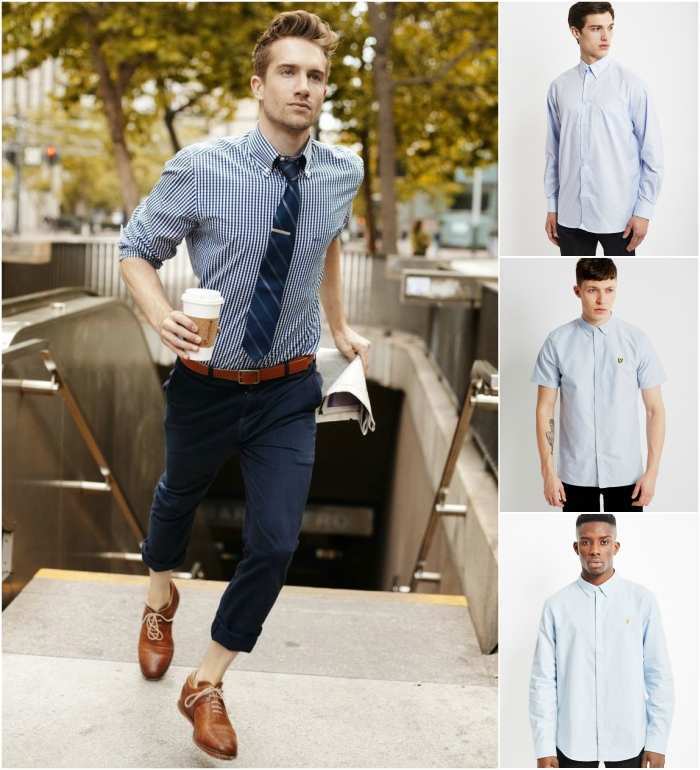 If you're short, keep your shirt tucked in to emphasise the length of your legs rather than drown them out. Also try elongating striped designs to help draw attention to the length of your body. There you have it: from t-shirts to dress shirts, it really is possible to find a great shirt for every occasion – and every shape. Just follow some of these simple style dos and don’ts; play around with looks that you like; check out your favourite fashion icons for inspiration; and you’ll soon be on your way to pulling together an outfit that shows off all your unique qualities to their fullest advantage. Don’t be afraid to try something new: if you have confidence in your body and wear something you feel comfortable in, you are certain to look the part. And just remember: if in doubt, try it on!